Invented by C.G. Johnson in 1926 garage door openers are very useful devices in your door’s mechanism as it helps to make your door easy to use. 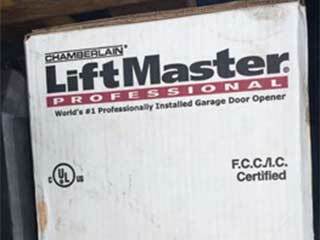 Opener brands include LiftMaster, Chamberlain, Craftsman, etc. They contain an electric motor attached to a power unit: the power unit supplies electric current to the motor which turns a rod producing a pull force that is transferred from the motor to an arm attached to the door through a belt, chain, or threaded rod, and this process pulls the door up or down. Garage doors are divided into types based on the type of drive they have: chain, screw drive, and belt drive. These three types are efficient in their own way and none is better than the other; manufacturers of every type have advanced the tech of their versions to be at par with other versions. In this type, the shaft that rotates in the motor transfers the force from the rotation to the door arm using a belt. This belt made out of several kinds of materials including fiber-glass, polyurethane, rubber (steel-reinforced), etc. This type is very suitable for light-weight garage doors. Belt drives are preferred for their quietness and smoothness in operation as compared to other types. Howbeit, they are only slightly more expensive than chain drives. In chain-driven openers, the force from the rotation is transferred to the door using chains instead of belts. The chain is similar to what you find on bicycles and they are connected to gears attached to the spinning shaft in the motor. Chain drives are hardy and tend to last longer than their counterparts if well maintained. They are also the least expensive. They require a bit more maintenance than belt drives, requiring lubrication and adjustments. Fortunately, it only takes about 15 minutes to carry out these tasks. Again, chain-driven openers can be pretty louds. If you want something inexpensive and don’t mind the noise you could go for this type. This type is quite different from the aforementioned types; in this type a threaded rod (like a very long screw) is attached to the trolley and so the screwing and unscrewing of the threaded rod create the pulling and pushing force that opens and closes the door. Screw-driven openers are very easy to maintain owing to the fact that there aren’t many moving components. They also operate more silently than chain drives. They only need to be lubricated once in a while but do not need adjustments. Note: they are very sensitive to sharp temperature changes. Knowing about these three types is the first step to choosing the best type for your needs and budget. Don’t hesitate to contact our experts for more information!